Why is there so much wealth inequality? Economists have been trying to answer that question for decades, and one interesting way to think about the problem has to do with geography. Our new visualization highlights the yawning gap between the top 1% of earners and the bottom 99% for every state in the country. We gathered the numbers for our visualization from the Economic Policy Institute (EPI), a nonpartisan think tank devoted to informing fiscal policy discussions. We plotted the average annual income for the top 1% of wage earners in each state. Then we added the average income for the bottom 99%, essentially dividing the entire workforce into two groups. The gray bar on our visual therefore the size of the gap between the highest earners and everybody else, letting you quickly and easily see the extent of income inequality across the US. Indeed, the gap is quite staggering. 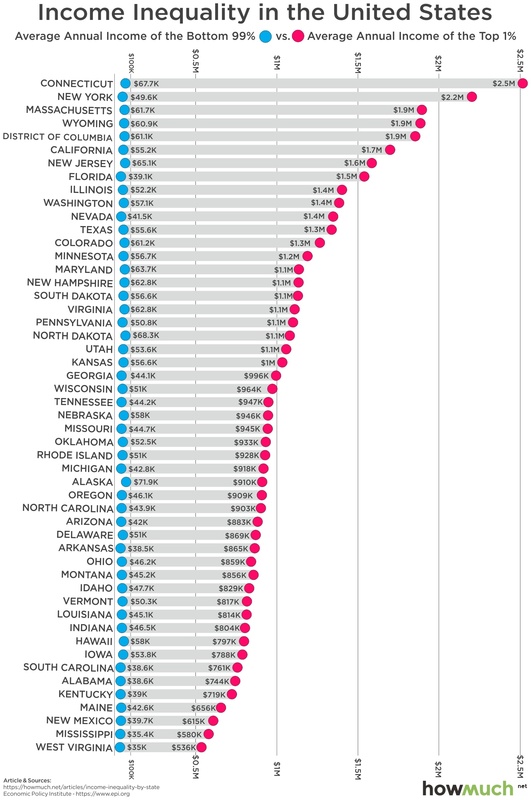 Across all 50 states plus Washington DC, the average difference is $1,047,435, a factor of 21.4 times. The states with the worst problems should come as no surprise: Connecticut, New York, and Massachusetts have well-documented wealth inequality problems. One notable state at the top of the chart is Wyoming. We previously used EPI data to single out Jackson Hole as the most unequal location in the entire country, no doubt due to its status as a retirement destination for the uber rich. There’s another interesting trend lying just below the surface of our visualization. Take a look at the states with the lowest wealth inequality, toward the bottom of the visual. West Virginia, Mississippi, Maine, Kentucky and Alabama have the smallest gaps between the wealthiest 1% and everyone else. But these same states are widely known for their rural poverty and poor overall public health. In fact, the bottom 99% earn some of the lowest wages anywhere in the country. The states with the lowest wealth inequality are also the poorest states in the country, which suggests one of two things. Either a rising tide lifts all boats, meaning the wages of the extremely well-paid inflates what everyone else makes too. Or states like West Virginia, where the average annual income for 99% of the population is a paltry $34,987, have economies that depress the wages of the top 1% too. Regardless of how we think about the correlation, moving across state lines to earn a higher wage seems like a plausible answer, even if fewer Americans are willing to move for jobs. Let’s add one more layer of complexity. Our visual says nothing about the cost of living. For example, the bottom 99% of workers in Ohio make $46,157, but our recent analysis of housing prices indicates that’s plenty to afford a median-priced home in all of Ohio’s large cities. Wealth inequality is still no doubt a top concern for policymakers, but the real statistics aren’t exactly terrible for the average Joe in every circumstance.